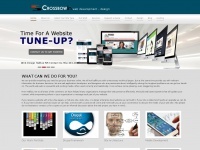 Build Something Amazing, CROSSBOW Interactive - International web design and development Est 2003. Contact us for a quote or just an informal discussion about the web project you have in mind. 6 links pointing to Crossbowin.ca were found. Individual words like Crossbow, Read and Crossbowin are frequently used in text links from other websites. The most important links to the website are from Bbnovascotia.com and Whaleandsealcruise.com. The homepage of Crossbowin.ca and the subsite are most referenced by other websites. The table shows the most important links to Crossbowin.ca. The table is sorted in descending order by importance. The table shows websites of Crossbowin.ca, which are often linked by other websites and therefore they are classified as important content. The web server used by Crossbowin.ca is run by Web.com and is located in Atlanta, USA. On this web server 50 other websites are hosted. The language of those websites is mostly english. The Crossbowin.ca websites were developed using the programming language PHP and served by a Apache server. For managing the data of the webpages the CMS Drupal in the version 7 is used. XHTML+RDFa 1.0 is used as markup language on the webpages. Indexing the data of the website and following hyperlinks on it is explicitly allowed by robot information.